Explanation: A gorgeous collection of dust and gas nebulae in the Northern Milky Way graces the high and far off constellation of Cepheus. With colors based on astronomical filters, this close up of the region highlights stars embedded in curiously shaped cosmic clouds. Near the central faint (9th magnitude) star in the image, dust clouds reflect the starlight, creating a bluish reflection nebula cataloged in 1966 as VDB 142. The area's bright reddish emission nebulae indicate the presence of clouds of atomic hydrogen gas. Stripped of electrons by invisible ultraviolet light, the hydrogen atoms emit their characteristic visible red light as electrons and atoms recombine. 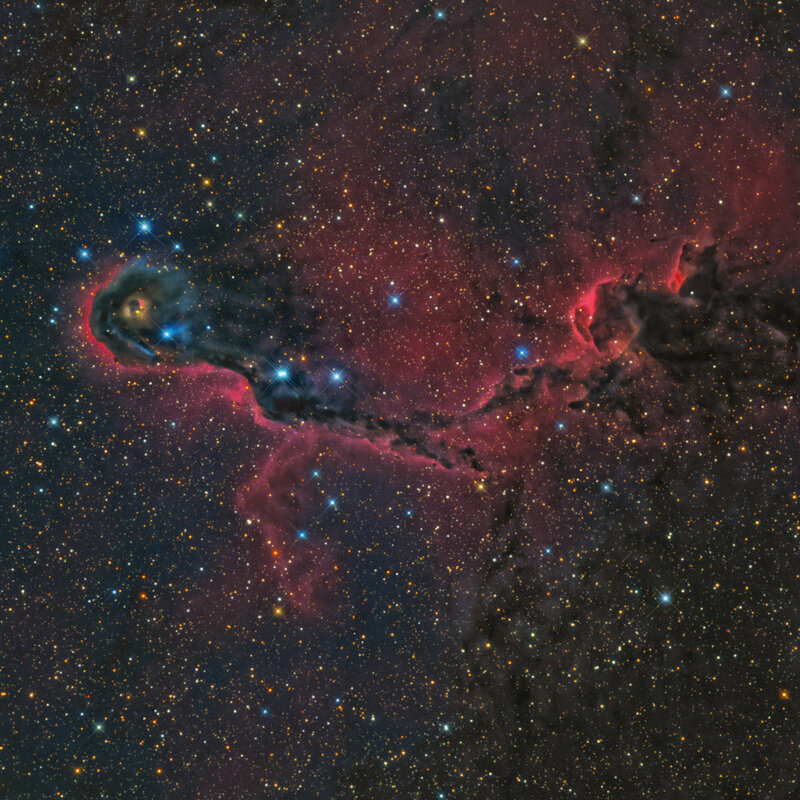 Sweptback clouds of obscuring dust, dark nebulae, are silhouetted against the bright background. Representing the stuff stars are made of, all these nebulae lie within the large young star cluster complex IC 1396, 3,000 light years from Earth.